UVGI Systems for air conditioning systems need special attention in design and installation. The dampness present int he air is why UVGI Systems are needed in the first place. That is why Spectra UVGI Systems are provided with features that make them the best in class for air conditioning systems. 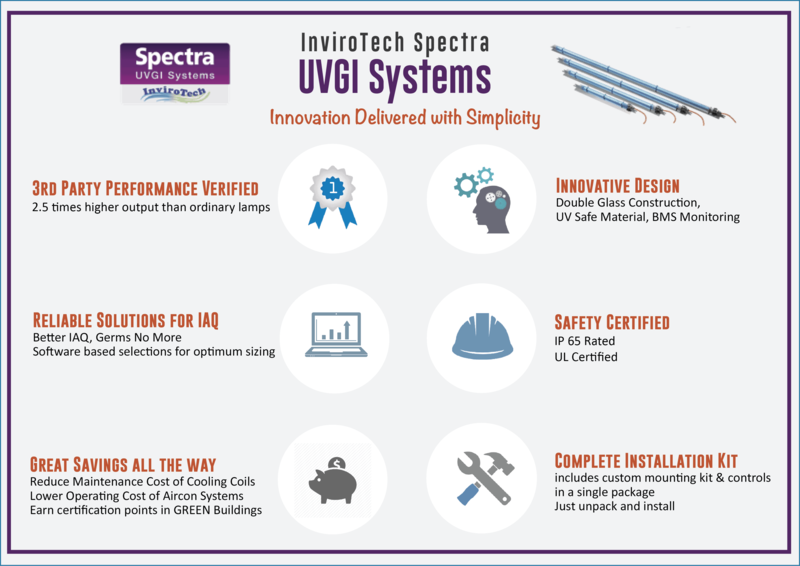 InviroTech Spectra UVGI Systems match exactly with your needs. With the design capabilities and advanced custom software solutions available at InviroTech, you get assurance of reliable and efficient solutions that work. Spectra UVGI Systems are certified by TUV Nord for its performance. It also holds IP 65 rating as well as UL Certificate to ensure 100% safety for the cold & damp air which can carry water to the lamp and may cause short circuits. Spectra UVGI systems comes with a complete installation kit, for which no other parts are required to be purchased. Just Open the Kit and install as per the instructions and you are good to go. For enquiries write to us.